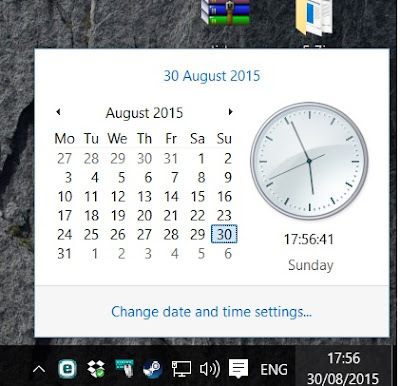 Hello and welcome to this new tutorial, today I will guide you on how to change Windows 10 digital taskbar clock to the old Windows 7/8 analog clock. Open the Windows registry tool, press "Winkey+R" and type "regedit" without quotes ! now navigate to this folder : "HKEY_LOCAL_MACHINE\SOFTWARE\Microsoft\Windows\CurrentVersion\ImmersiveShell"
here you'll have to create a new entry DWORD (32-bit) key and name it "UseWin32TrayClockExperience". Double click on it and set the value to 1 and click OK.
That's it now you should see the old analog clock when you click on the time-taskbar. Standard Windows 10 digital clock. Old Windows 7 analog click.